Hip 458, a War Front colt, sold to the Coolmore partnership for $2.4 million at the 2018 Keeneland September Yearling Sale. Throwing back to the pre-recession days of Coolmore and Godolphin slugging it out for seven-figure horses, the two entities have been economic drivers at the top of the market as the Keeneland September Yearling Sale hit its halfway point for Book 1, with Coolmore landing the biggest blow so far on Tuesday when it bought a War Front colt for $2.4 million. The hammer price made the colt the world's most expensive yearling sold at public auction in 2018. At the end of Tuesday's session, the 13 horses that changed hands for seven figures at this year's sale matched the final total from the 2017 edition. While day-to-day figures are difficult to compare with the select Book 1 expanding from one day to four, that number resonated with Keeneland's director of racing and sales Bob Elliston. “I cannot sit here and tell you we thought it would be as strong as it was it was today,” he said. “Everybody had high hopes that given the quality of the stock that we had seen, the pedigrees and the pages, and observing what had transpired in prior sales this summer, and knowing who was coming. The entire world was coming to this sale and they had their piggy banks broke open. They went after it today. It was quite a show. “It was competitive at the top, it was competitive in the middle, and it was competitive at the bottom,” Elliston continued. “When you have a 21 percent RNA rate, there's a lot of business getting done. Tuesday's session closed with 168 horses sold for revenues of $65,835,000. The average sale price finished at $391,875, while the median settled at $300,000. At the halfway point of Book 1, a cumulative total of 306 yearlings have brought $114,455,000, with an average of $374,036 and a median of $300,000. Coolmore and Godolphin accounted for four of the eight horses sold for $1 million or more on Tuesday, led by Coolmore's session-topping War Front colt. The dark bay or brown colt, Hip 458, is the second foal out of the Grade 1-winning Smart Strike mare Streaming. His third dam is 2007 Broodmare of the Year Better Than Honour, putting him in the family of champion Rags to Riches, Belmont Stakes winner Jazil, and Breeders' Cup Marathon winner Man of Iron, among others. Magnier said the colt would be sent to Ireland to join Coolmore's European stable. Hill 'n' Dale Sales Agency consigned the colt, as agent. The session-topper is a product of Sikura's broodmare band, where many of his homebred mares are named with action words ending in “ing.” The tradition started with the colt's second dam, Teeming, who had fillies Streaming, Treasuring, Cascading, Distracting, Gifting, Achieving, and Honouring. While Sikura has used the name scheme for other mares, this particular branch has been especially meaningful. Earlier in the session, the Coolmore partnership went to $1.2 million to buy Hip 306, a first-crop American Pharoah filly out of the Grade 2-placed Beau Genius mare Pretty 'n Smart. The chestnut filly is a half-sister to Grade 1 winner Cupid, Grade 3 winners Heart Ashley and Ashley's Kitty, and stakes winner Indianapolis. Coolmore raced Cupid and stands him at its Ashford Stud in Lexington, Ky. 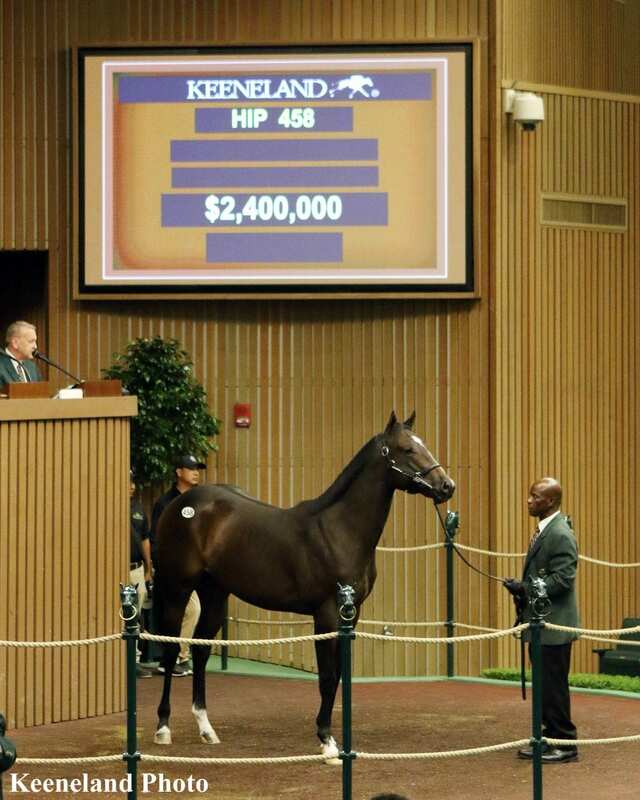 The group also previously campaigned Indianapolis, and topped last year's Keeneland September sale for a full sister to Cupid, going to $2.7 million. Magnier said the filly would be sent to Europe to be trained by Aidan O'Brien. VanMeter-Gentry Sales consigned the filly, as agent. Pretty 'n Smart has been a cornerstone mare for the consignment, both on the racetrack and in the sale ring, residing at Waggoner Farm in Lexington, Ky. Her broodmare was managed by Olin Gentry, who died suddenly in June. “She's had the sale-topping yearling for us every year we've been in business, since 2011,” Tom VanMeter said. “Olin Gentry picked her out right on the track, paid $75,000 for her, and we've sold something like $7 million out of her, so it's been pretty awesome. VanMeter said the American Pharoah filly showed about 200 times in the days leading up to the sale, indicating strong interest. After an active day of buying on Monday, the Godolphin operation returned for more on Tuesday, landing a half-sister to 2016 Kentucky Derby winner Nyquist by War Front for $1.75 million. The bay filly, Hip 389, is out of the winning Forestry mare Seeking Gabrielle, whose first foal was Nyquist, a son of Uncle Mo who was named champion 2-year-old male of 2015 and retired to Godolphin's Darley America stallion base in Lexington, Ky. The filly was offered as property of Hinkle Farms, which bought Seeking Gabrielle in foal to Blame for $100,000 at the 2013 Keeneland November breeding stock sale. The weanling Nyquist, by Uncle Mo, sold a hip earlier to Madison Farm at the 2013 sale for $180,000. Hinkle said the filly that sold Tuesday showed about 250 times in the days leading up to the sale, and the hammer price was the highest ever for a yearling he had consigned. Godolphin also bought Hip 456, a Curlin colt out of the stakes-winning Flatter mare Stoweshoe for $1.3 million. The colt is from the family of Grade 1 winner Taris and Grade 3 winners Don't Be Silly and Spring Beauty. Bloodstock agent Mike Ryan briefly had Tuesday's session-topper after signing on Hip 383, an Uncle Mo colt, for $1.4 million on behalf of an unnamed partnership. The bay colt, named Secret Agent, is out of the placed Street Cry mare Secret, whose first foal to race is a winner. Grade 1 winner Well Chosen is in the extended family. Bridie Harrison consigned the colt as agent for Peter E. Blum Thoroughbreds. Hip 388, an Empire Maker colt sold to Phoenix Thoroughbreds for $1.35 million. The bay colt is out of the winning Carson City mare Seeinsbelieven, who is the dam of Grade 2 winner Conquest Big E and stakes winner Aquapazza. Grade 2 winner Softly is in the extended family. VanMeter-Gentry Sales consigned the colt, as agent. Shadwell Estate Co. went to $1.2 million to land Hip 291, a War Front colt out of the English stakes-placed Lookin at Lucky mare Pin Up. He is the first foal out of Pin Up, with an extended family including Group 1 winners Yesterday, Quarter Moon, and Diamondsandrubies. Dromoland Farm consigned the colt, as agent. Also hitting the seven-figure mark was Hip 297, a Pioneerof the Nile colt out of the Grade 2-winning Pomeroy mare Pomeroy's Pistol, who sold to the partnership of Albaugh Family Stables and Spendthrift Farm for $1 million. Former Albaugh runner Brody's Cause stands at Spendthrift Farm in Lexington, Ky., and Grade 1 winner Free Drop Billy is committed to stand there upon his retirement, setting the foundation for Tuesday's partnership. Jason Loutsch, general manager of Albaugh Family Stables, said on Monday that the operation had come to the sale to buy colts, and it had picked up some capital that day after selling a homebred Tapit filly for $1.4 million. “If we hadn't sold that one, I don't think I'd be bidding on this horse,” said Dennis Albaugh. Brookdale Sales consigned the colt as agent for Hardacre Farm. To view the session's full results, click here. This entry was posted in Bloodstock, NL Article and tagged albaugh family stables, Bridie Harrioson, Brookdale Sales, coolmore, Dromoland Farms, empire maker, Gerry Dilger, Glennwood Farm, Godolphin, Hardacre Farm, hill 'n' dale farms, Hinkle Farms, John G. Sikura, john gosden, Justify, Keeneland, keeneland september yearling sale, mike ryan, nyquist, phoenix thoroughbreds, Pioneerof The Nile, Pretty 'n Smart, Seeking Gabrielle, Shadwell Estate Co., spendthrift farm, Stage Magic, Streaming, Tom Hinkle, VanMeter Gentry Sales, war front by Joe Nevills. Bookmark the permalink.